April 19, Good Friday, at 7 p.m.
10 a.m. - ELW Worship: this service is a creative blend of both the conversational and liturgical services; and a refreshing way to begin your Sunday morning and week. Worship music is selected to enhance the worship experience of each service and includes a blend of traditional hymnal, modern hymnal, and instrumental band music. 11 a.m. - Fellowship: enjoy a friendly conversation over a cup of coffee and snack during Fellowship. Come As You Are - We're committed to welcoming people as they are, so please wear clothes that are comfortable for you. Some wear ties and dresses, others wear jeans and sandals. We celebrate your presence with us, so come as you are! ​No Pressure to Stand or Sit - Yes, our services have indicators to sit and stand throughout. However, please do not feel pressure to do so if it is physically difficult for you. Christ Lutheran is presently in a Call Process and in a search for a minister who will help carry us forward in ministry and mission. In the meantime, every Sunday, we have a wonderful group of passionate and caring pastors from which each of our weekly services is led. You're invited to join us every Sunday! We are confident this week's gospel message will be enriching and fulfilling to you. ​10 a.m. Summer Worship. This service is a creative blend of both the conversational and liturgical services; and a refreshing way to begin your Sunday morning and week. For any event, we need to come together with a purpose in mind. This includes our confession and God's offer of forgiveness, as well as musical praise of God. For Christians, the fullness of the Word is Jesus Christ. In worship, we acknowledge Jesus as Word through scripture, prayer, song, preaching, and art. 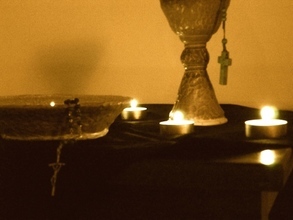 Rituals help us to engage our faith. Our sacraments, the rituals of the Lord's Supper (or Eucharist) and of Baptism, connect us with God and with one another. Each Sunday service typically includes the Eucharist, and we invite any who are interested in baptism to speak with Pastor Andrew. Through the Word and Sacrament, we are reminded of our identity as God's creations who carry the compassionate image of Christ into the world. Through song and commission, we are sent to bring the Gospel to all people. Though we are sans pastor, we are not without spiritual leadership on Sundays. CLC is currently in a call process for a pastor, and our weekly visiting ministers are like a spiritual “box of chocolates.” Each week, one of our visiting ministers delivers a beautiful and inspirational message to help cleanse our spiritual palate, leading us into the new week with spirit-filled thoughts and actions.